Artwork Panel: 31.6cm x 100.5cm ≈ 12½" x 39½"
Silk/Brocade: 40.9cm x 156.2cm ≈ 16" x 61½"
Width at Wooden Knobs: 49.9cm ≈ 19½"
Several people have spontaneously asked for this over the years, so we thought it was time to add it as a regular item. 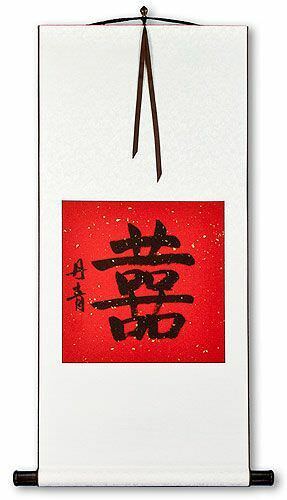 The symbol at the top is of course, "double happiness", the symbol of a happy wedding and marriage in Chinese culture. In this case, it is written a the top of the artwork panel. 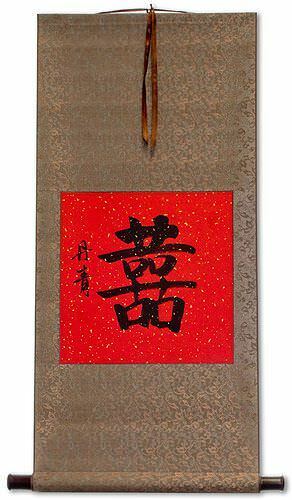 A vast amount of space is left below the character so that guests can both sign their names and give good wishes. At the end of the wedding, it will look like a page from your high school yearbook. But this is something that you can hang and display on your wall for a while. When you feel the time is right, you can roll it up, and put it in your memory box. This is a great and unique keepsake. Instructions for use: I suggest you lay the scroll out flat on a table (preferably a glass table, or a table that is very flat, as to allow for smooth writing). Thin felt tip pens may work better, as aggressive use of a ballpoint pen could cause a small tear. I've heard feedback from one customer who hung two of these on glass doors at the church (not doors that were being used for coming and going). She used a suction cup with hook to hang them, and said it worked out well. I still think laying it flat on a table is a more controlled method (you wouldn't want your guest book to come flying off a door). If you would like us to make you a custom guest book wall scroll (or two), just post your request on our forum, and we'll be happy to comply. We have several colors of silk and papers that can be used in constructing such a scroll, though red paper is almost mandatory, as a good luck color, for Chinese-themed weddings. This piece is painted with special Chinese ink on xuan paper (rice paper) mounted to a traditional silk scroll. The artist's name is "Li Dan Qing" who is from Beijing, China. 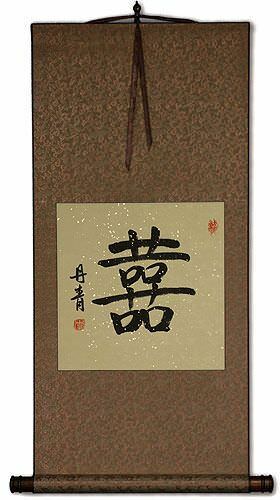 He is an older man with good calligraphy skills. To create this art, Li Dan Qing used special Chinese ink on thick rice paper. Then I took it to the best painting mounters in Beijing to mount the painting on a silk scroll.